I haven’t updated this blog for a long while, but it doesn’t mean I stopped with my astrophotography hobby. It is a frustrating hobby, because depends on the weather conditions, and with the weather in Netherlands, there are a long period where all nights are cloudy, so I have to wait for a great span of time to be able to shot some more pictures. But every session is a learning experience. 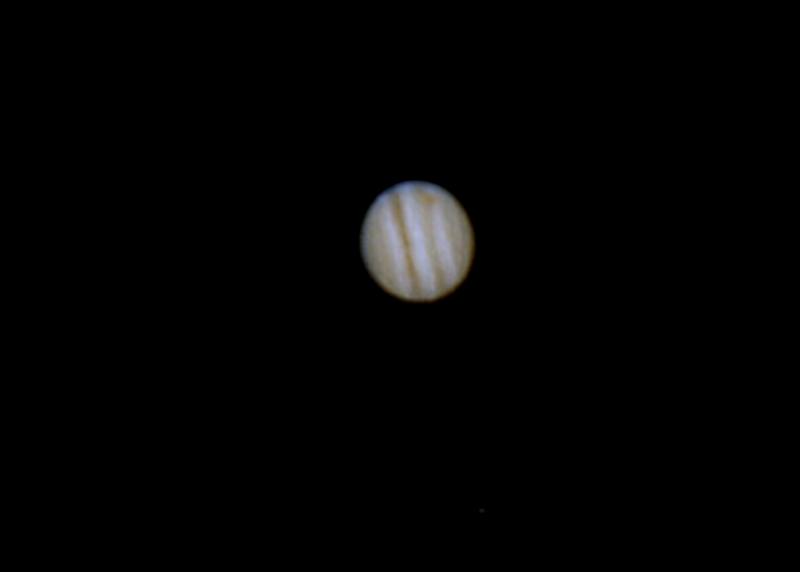 Planet astrophotography is very different than deep sky. First place because eventhough it is very small, planets are very shinny. So you need actually very short exposures. And since they are small atmospheric disturbances are a big issue. So for planetary imaging, it is very common to use videos, instead of pictures. So you make a 100 or more frames video (which is nothing more than 100 pictures). The more frames the better, but not too much, because the planet is spinning in its rotation, so if you make the video very long, the features of the planet will shift slightly and you lose the details. For my first trial, I am very happy with the result. I think i could improve a bit in the focus. And I believe I could have taken 1000 frames, instead of the 200 I did. Also, in the scope, I could see 5 of Jupiter Moons, but once you set up the configuration to see well Jupiter’s features, the Moons disappear. In the second picture I manage to have some few pixels in there that are 2 of the closest big moons. In this same night I also got some shots of Venus, but they were to bad to get any nice picture. Will try again when the weather let me.